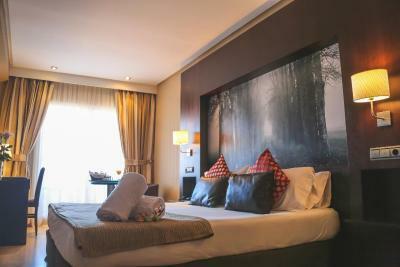 Lock in a great price for Ulises Hotel – rated 8 by recent guests! It hotel is perfect to know Ceuta because it is in the center of Ceuta. Friendly staff at check in. Remembered us from previous trips. It was clean. In the city center. Very good coffee and food in front of the hotel (Ulises cafe and next door restaurant). There was a terrace in my room, it was very nice to have it. Big room and bathroom. The room was very comfortable. The hotel staff came by with a "welcome to the hotel" small candy goody bag, which was a nice touch. Parking was validated. All of the people that work at the Ulises càfe and front desk are very helpful and friendly. I stayed in the cafe and worked for hours. I would like to especially thank the cafe Manager for his kindness. Location, right in the middle of everything. The staff were so kind and after we checked out they let us keep our bags for the day while we shopping. Ulises Hotel This rating is a reflection of how the property compares to the industry standard when it comes to price, facilities and services available. It's based on a self-evaluation by the property. Use this rating to help choose your stay! One of our top picks in Ceuta.Hotel Ulises is in the heart of Ceuta, just a few feet from Ribera Beach. This designer hotel has a seasonal outdoor swimming pool. Rooms at the hotel are modern and elegant. They all have a large plasma TV with satellite channels. They also have air conditioning, a minibar and a safe. The private bathroom has a hydro-massage shower. The Ulises Hotel has a stylish bar. Breakfast and tapas are available in the hotel's cafe. There are plenty of bars and restaurants within a 5 minute walk. The hotel is set next to Plaza España. The Mediterranean Marine Nature Reserve is nearby. There are impressive views of the Strait of Gibraltar and Morocco. This property also has one of the top-rated locations in Ceuta! Guests are happier about it compared to other properties in the area. When would you like to stay at Ulises Hotel? 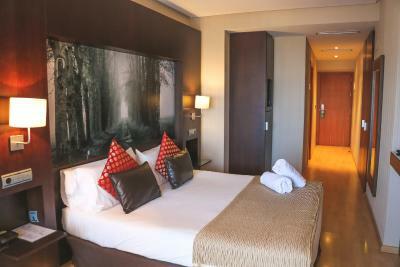 This modern and elegant room has a large plasma TV with satellite channels. There is also air conditioning, a minibar and a safe. The private bathroom includes a hydro-massage shower. This room comes with either a 42"-inch plasma TV or a hydro-massage bathtub. Has a separate sitting area and walk-in closet. The bathroom has a spa bathtub and hydro-massage shower. This modern and elegant room has a TV with satellite channels. There is also air conditioning, a minibar, and a safe. House Rules Ulises Hotel takes special requests – add in the next step! Ulises Hotel accepts these cards and reserves the right to temporarily hold an amount prior to arrival. Please note that an international credit card is needed as a guarantee and to pay for the booking. Elevators are 27 in wide and 38 in deep. I am a Hotelier on Booking.com. I wrote ahead of time and told them that. I asked for the customary upgrade. Instead I was upgraded and charged an extra €25 without my permission. We had a room above the restaurant and there was a loud party right below us. There was no hot water the morning after. Close to town, easy to get to. The slight smell of drains in the room. Great central location. Staff very helpful. Room clean, just a slight smell of drains in our room but our friend's room on a lower floor did not have this problem so may not be across the board. Central location and very helpful staff. The rooms we had were very small, the breakfast was low standard, we were a bit disappointed. Its location, it’s in the city center, you can go from there wherever you want. The pool wasn't open and the beds mattress need to be replace. Breakfast starts early but because they do not cook on site, not all of the menu items arrive promptly. We started eating early but the eggs (scrambled /fried) arrived as we were leaving. The bread two mornings in a row would serve better as a hocky puk. I am sure, that if the staff we forced to eat this bread - they would have comments as well. There was a constant odor of sewage that prevailed throughout our room/bathroom as well as the adjoining rooms. We tried plugging the drains with our towels, but little worked. I didn’t like that the double bed was two twin beds pushed together (this never works). It woukd be nice if the added a kettle for the room for tea or coffee. The beds were very hard, but I prefer a softer matress. The staff were friendly and had a place to store our bikes. It was clean and looked very nice. There was ample hot water and toiletries. It was an excellent location to get around from. The room had a hair dryer, fridge and plenty of drinking glasses. Too much noise in the room. Breakfast were on the both mornings late. The coffee mashine had plenty of possibilities, but only one hot water and "cafe solo" worked. It seemed that there was only one worker, and he came to work too late.